Abraham Flexner (1866-1959), raised in Louisville, Kentucky in a family of poor Jewish immigrants from Germany, attended the Johns Hopkins University in the first decade of its existence. After graduating in 1886, he founded, four years before John Dewey’s Chicago “laboratory school,” a progressive experimental school in Louisville that won the attention of Harvard President Charles W. Eliot. After a successful nineteen years as teacher and principal, he turned his attention to medical education on behalf of the Carnegie Foundation. His 1910 survey — known as the Flexner Report — stimulated much-needed, radical changes in American medical schools. With its emphasis on full-time clinical teaching, it remains the most widely cited document on how doctors best learn their profession. 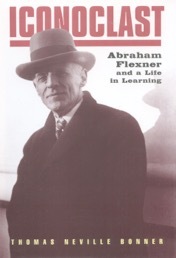 Flexner’s subsequent projects — a book on medical education in Europe and a comparative study of medical education in Europe and America — remain unsurpassed in range and insight. For fifteen years a senior officer in the Rockefeller-supported General Education Board in New York City, he helped distribute grants — more than 6 billion in today’s dollars — for education in medicine and other subjects and started the Lincoln School in 1917. His devastating critique of American higher education (“Intellectual inquiry, not job training, [is] the purpose of the university.”) raised important questions, upsetting many educators. In 1930, Flexner created and led the Institute for Advanced Study at Princeton, convincing Albert Einstein to accept the first appointment at the new institute.